Chrome is my web browser of choice. One of the main reasons are the extensions that you can add into the browser. If you not familiar with this concept, Chrome Extensions are like little apps that you add to your browser. You can add them by going to the Chrome Web Store. Once installed, they will appear at the top right of your tool bar next to the URL or address bar. It is super simple. Ebates is probably something you have heard of from an ad on television. The ad tells viewers how much money they have earned shopping online. It is a real thing. I used to think it was a gimmick, but it does work. Now this isn't going to let you quit your day job, but it will save money for you over time. Install the Ebates Chrome Extension. When you are shopping online, a window will appear if you visit a shop that has an Ebate deal. Just activate, and when you complete your purchase, you earn money that will come back to you in the form of a check or Pay Pal deposit. And it does add up over time. Ebates can be used everywhere from Amazon to hotels to Ebay. Since it is an extension, you don't have to look for a coupon. Ebates is working on the background and notifies you of deals that are available. Honey is a new Chrome Extension. This is the perfect Chrome Extension for Amazon shoppers. Once you are shopping on Amazon, it will tell you it the items you are viewing or have in your cart are available at a cheaper price from another seller! It is that easy! I have tried it out and have found things to be $5 or more cheaper from other sellers. Who doesn't want to save money! And these are both tools that work for you without any searching for codes or online coupons! So get out there and install come Chrome Extensions into your browser. These two are ones that you can use all the time. Especially if you online shop. You can thank me later! Do you know of other money saving Chrome Extensions or tools you use online? Feel free to comment and share! I'd love to hear more about how you shop online. Have a great week! When we bought our pop up camper, the floors had been redone by the previous owner and looked fine. However, we were looking for a way to finish the camper floor and make sure they remained durable and clean. I searched around online and found Instatrim. InstaTrim Flexible Trim Solution is a simple and cost effective trimming solution for pop up campers and RV's. 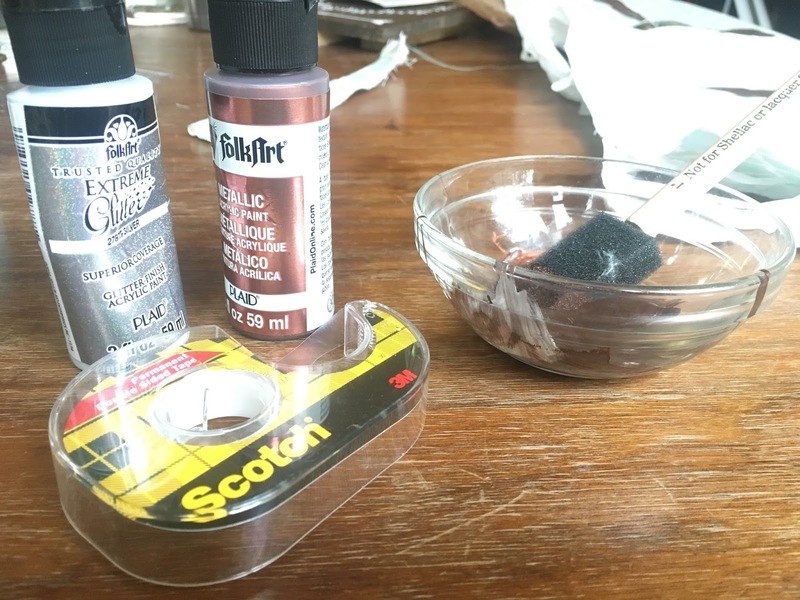 This mold and mildew resistant product is perfect to use with camping gear. It is flexible and self adhesive. Therefore it fits easily and simply into tight spaces. Also, this is the perfect product for someone finishing a project that may not have a lot of tools handy. In short, it is perfect for something with limited handyman skills. We needed a clean space and sharp blade for cutting. No need for saws and additional tools. This product is a plus because it is a hybrid of small moulding and caulk. Caulk is messy and never finishes neatly for me. And I don't have saws and tools for installing a wood product. Instatrim installs simply by measuring, cutting, peeling the self adhesive back off and sticking. That is it! The finished results are outstanding. I really like how this completes our project! 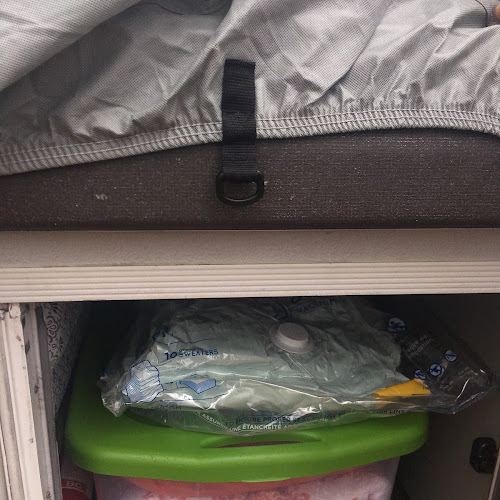 By sealing the edging between the floor and cabinet with the Instatrim, dirt and grime won't get trapped in the crack between the two. It is important to start out with a nice clean surface free from debris. It was recommended to clean the surface with a degreaser prior to installing. Or, clean with a soft cloth and rubbing alcohol. I chose the latter. Super simple. Aside from this prep, nothing else was necessary. The Instatrim is sold in 10 foot rolls and comes in a variety of colors. White, light brown and ivory are typical color choices. These three would work with nearly any decor. The floors looked nice but unfinished around the edges. The Instatrim is flexible and comes with a self adhesive backing that just peels and sticks to a clean surface. I was able to go around the floor and finish out our pop up camper in about 30 minutes! I couldn't believe how quickly it went. The big thing is to get the trim pressed tightly into the space working in small sections at a time. It is important to make sure that it lays flat and doesn't get bent underneath itself. Just straighten and keep working. Once it is all in, everything looks completely professional! See how nicely this seals the edges around the flooring! This product could easily be added to a new remodel or existing camper to finish the look. It was such a simple step that made me a lot happier with the overall look. This will be much easier to keep clean! This project took two 10 foot rolls. For less than $50, this upgrade is completely worth it and in reach for any DIY enthusiast. Finally, this is a great company. Instatrim works with Operation Honor to seal flag cases built by veterans for our country's heroes. Instatrim is made in the America and supports our American military through this project. Check out Operation Honor or Cornerflex, the makers of Instatrim, to learn more about the Operation Honor project or other products Cornerflex makes. Instatrim could be used at home as well. 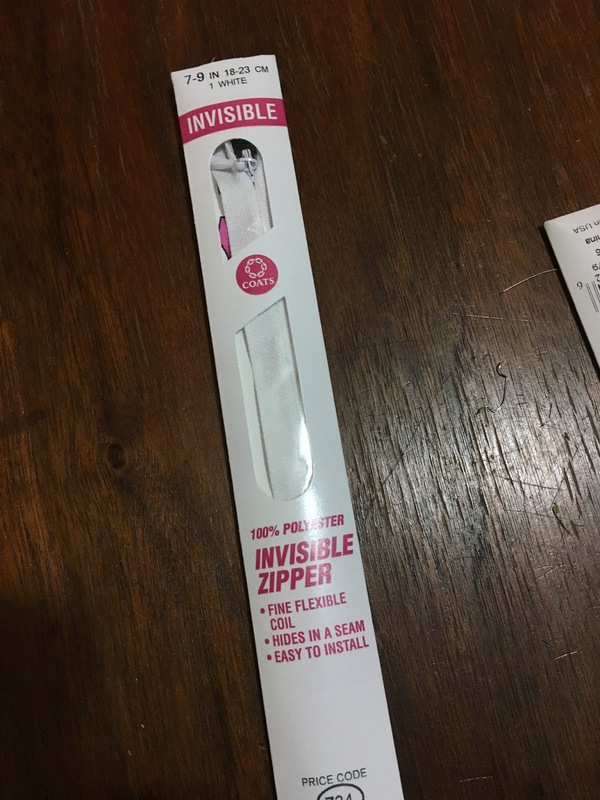 This is a product that can be used behind sinks, around commodes and other areas in the home to seal and protect against water damage. The flexibility of the product make it easy to mould into tight spaces. 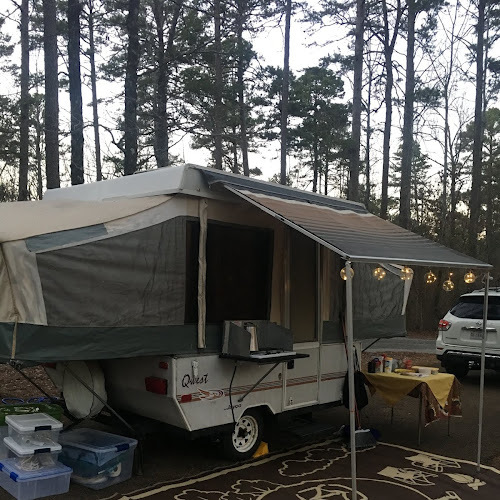 We are almost completely done with our Pop Up Remodel or Peggy Sue, as I have named our camper. It has been a labor of love. But, these little pieces of quick work that make everything neat and tidy. It makes me smile at the end of the day! I'll be doing a total reveal next week. Be sure to check it out. I can't wait to show the finished project after nearly a month of work! Ask questions if you have them about this product or other ones I have used. I'm happy to answer them for you! GRACE IS A PARTICIPANT IN THE AMAZON SERVICES LLC ASSOCIATES PROGRAM, AN AFFILIATE ADVERTISING PROGRAM DESIGNED TO PROVIDE A MEANS FOR SITES TO EARN ADVERTISING FEES BY ADVERTISING AND LINKING TO AMAZON.COM. THESE FEES ARE USED FOR FUTURE CAMPING FUN AND PROJECTS! Small changes add up to big results over time. High quality ingredients and new cooking methods are the main stars of Every Day Whole Grains by Ann Taylor Pittman. While learning about healthy whole grains, this book also shows home cooks how to cut fat and sugar. The finished dishes are worthy of bragging rights and easy to accomplish. These changes are the just the ones needed to begin building a healthier diet. I was introduced to this cookbook in a cooking class at Sur La Table led by Ann Taylor Pittman, the cookbook author. This cooking class featuring Everyday Whole Grains: 175 New Recipes from Amaranth to Wild Rice was enjoyable and delicious. Participants cooked a meal sampling recipes from the cookbook. We prepared salmon crusted with fried bulgur wheat, brussel spout and wheat berry salad, smoked polenta with browned butter and sage finished with salted chocolate chunk cookies. I was hooked. Returning home, I started trying recipes from Everyday Whole Grains with my family. This also meant stocking the pantry with new ingredients I read about in the book. Almost a year later, I'm still using this cookbook weekly and have enjoyed every recipe that I have tried. My family and friends tasting the recipes have given a solid two thumbs up. This cookbook has appealing photographs and information about whole grains that has inspired me to try a variety of ingredients at home. 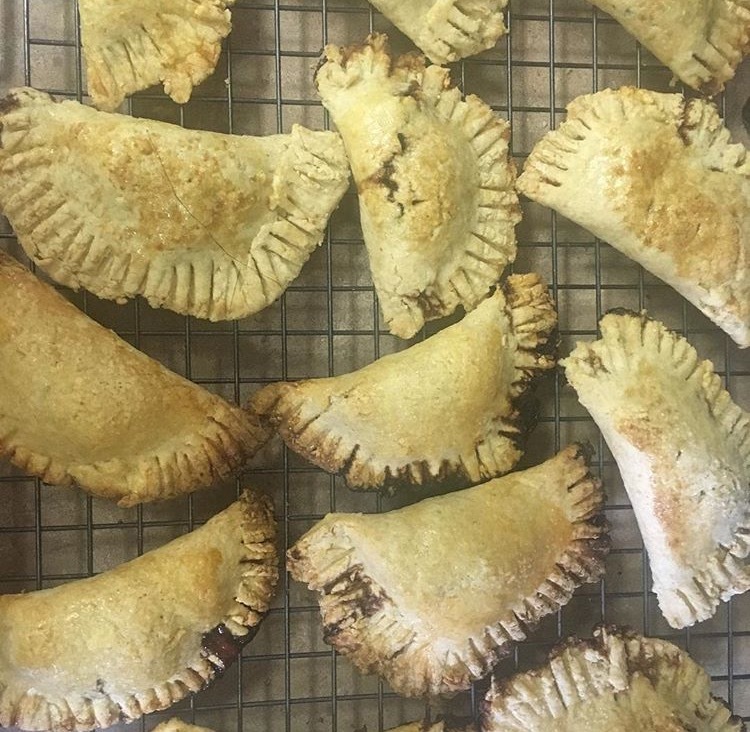 I learned how almond paste adds flavor and cuts fat in pastry dough. Different flours create different cookie textures and flavors. Grains can be used to create both interesting texture and flavor in salads. These are only a few examples of how whole grains can be used. I've also used this cook book as a reference for learning about how whole grains and new cooking techniques can be incorporated into my already favorite staples at home. Everyday Whole Grains is like a cooking course at my fingertips. I can explore each recipe and new grain at my leisure. I feel good about cooking healthier meals, snack and desserts with high quality and simple ingredients. The authors tips and notes on each grain has been extremely helpful. Ann explains her techniques fully so that any cook can easily follow along and achieve star quality results. There are notes and introductions for each recipe that is helpful in deciding about which recipes to try. 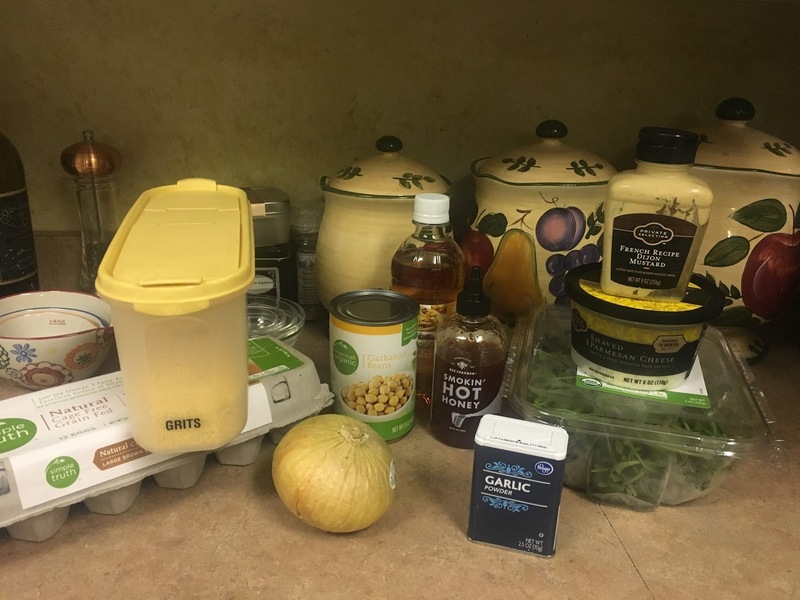 It is clear throughout that the Mrs. Pittman has researched grains and how to effectively incorporate them into a delicious and nutritious diet. I used to think of whole grains as breads and cereal. But, whole grains can stretch far beyond these basic foods. Pickling, frying, and pureeing whole grains brings new life to many common dishes with uncommon results. I've been amazed at how versatile whole grains can be in the kitchen. 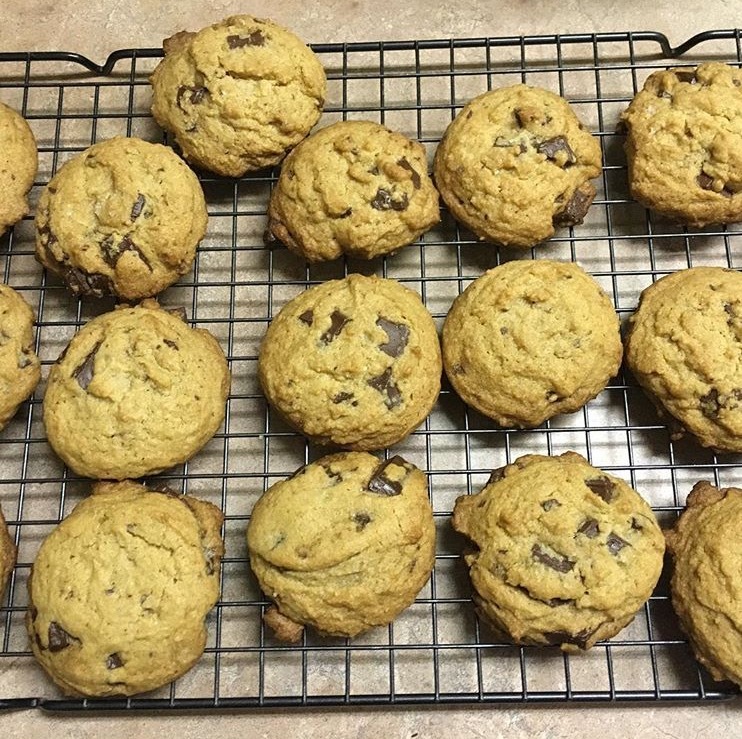 My first recipe to try at home was one we did at the cooking class - Salted Chocolate Chip Cookies. This cookie has the right balance of sugar. The cookbook describes 4 variations of this cookie with different flours. There is even a gluten free option with brown rice flour. I love having a few gluten free tricks up my sleeve for friends and family with specialized diets. 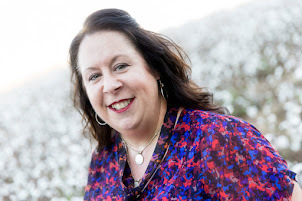 The author describes throughout the book how she incorporates healthy recipes into her home. It is an inspiring touch that encourages the reader to try something new too. 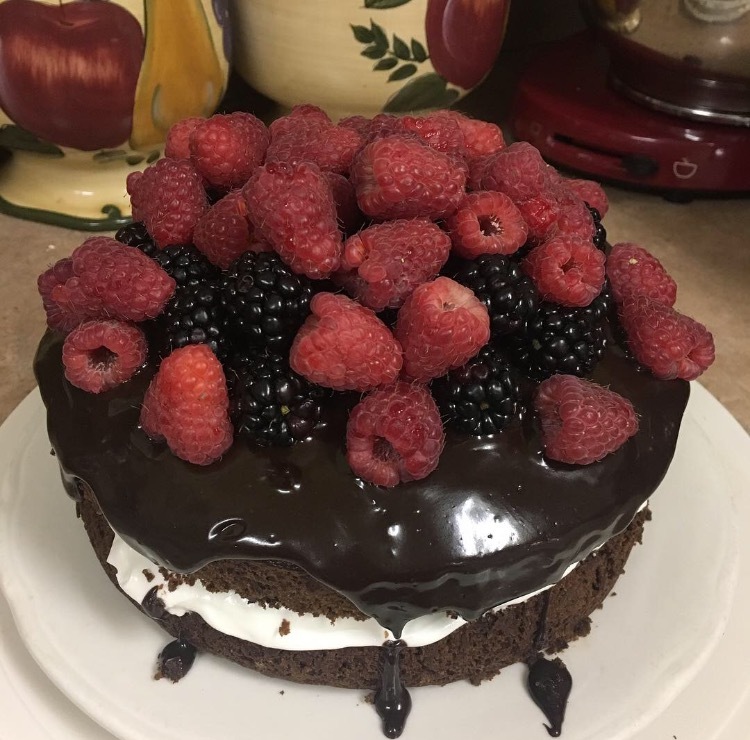 For my husband's 50th birthday and for New Year's Eve this year, I made a chocolate cake with yogurt cream filling and fresh berries. This cake is made with whole wheat pastry flour and cuts the fat with greek yogurt in the filling. Its a delicious cake without being overly sweet and is so simple to make. It is a show stopper that even beginning cooks can replicate. Whenever cooking from scratch, I am able to control the ingredients quantity and quality. And I believe this results in food where the food flavors truly shine as opposed to chemicals and unknown additives. 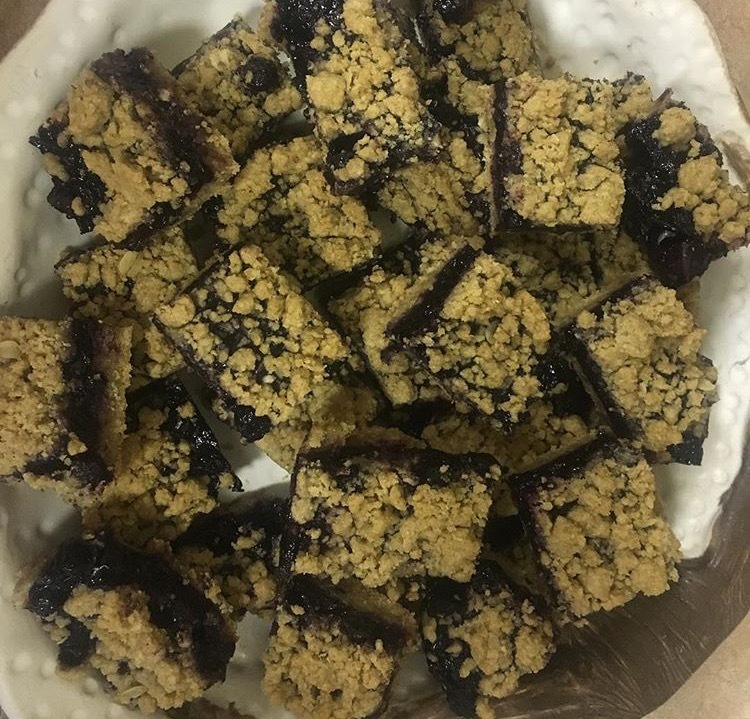 I have used Everyday Whole Grains to inspire my tailgate cooking this past year to treats to share at our family reunion. 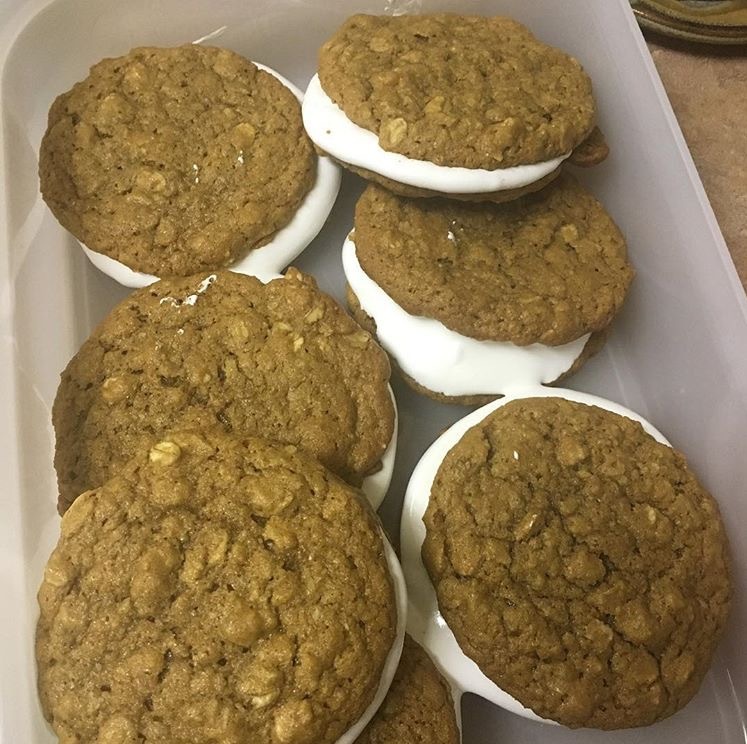 Homemade oatmeal cream pies were a hit for our family reunion trip this past summer. While this is still a sweet treat, ingredients were fresh and could be easily pronounced. Store bought commercial oatmeal cream pies cannot compare to homemade ones. 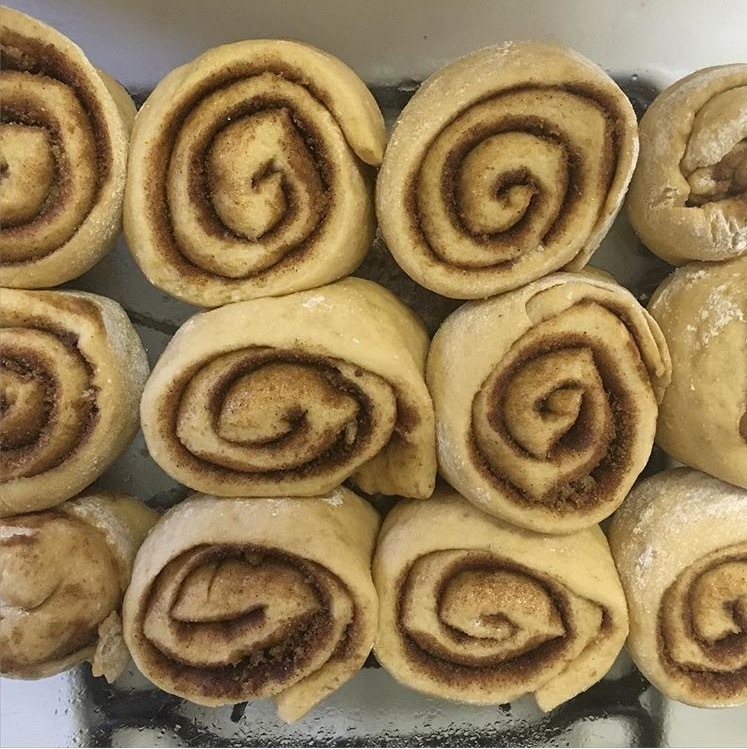 Every recipe that I have tried has been outstanding. And my family has definitely encouraged me as I tried new things. Even a simple loaf of bread makes the traditional peanut butter and banana sandwich extra special! 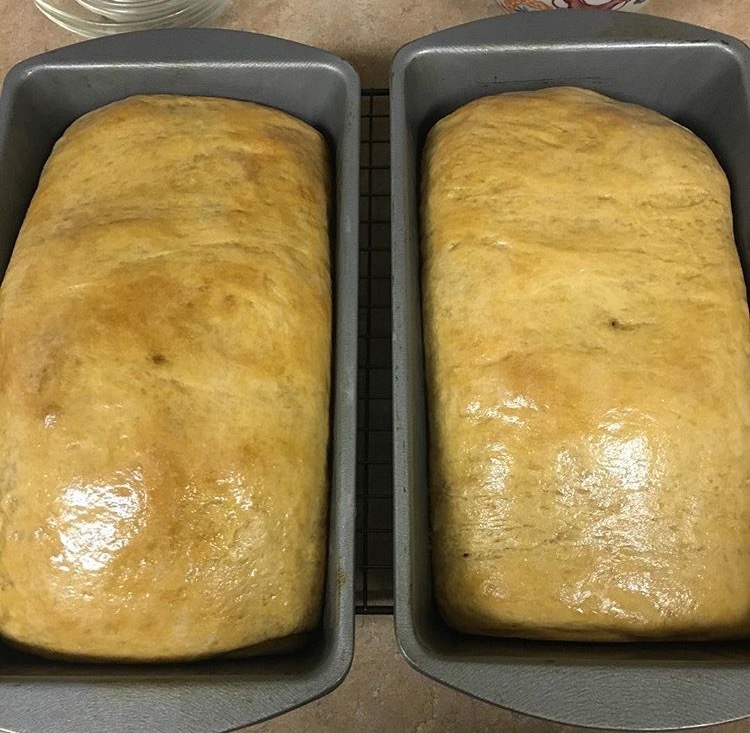 The Honey Wheat Sandwich Loaf is the perfect loaf of bread. I have used this recipe the most. 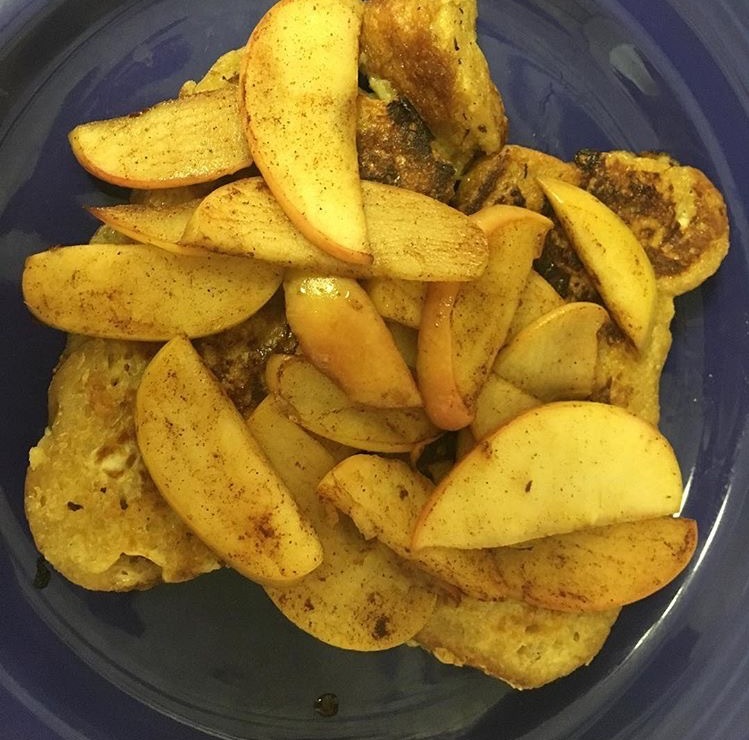 And the left over bread can be made into a delicious Best Ever French Toast with Maple Apples. Using evaporated milk instead of heavy cream and apples for a topping cuts both fat and sugar in this truly best ever french toast! You'll be hooked the first time you try it. And while most of my photographs show sweeter foods, I have tried savory dishes from this book like Barbecue Barley. This take on baked beans with barley as the main star. Chicken salad gets makeover with pickled barley. And Summer Salad with fresh grilled corn, arugula and tomatoes is the perfect side dish. I've even added pickled grains to my tuna salad for a little something extra. From snacks to sweets, main dishes to savory sides, this cook book helps make cooking tasty, fun and healthy. 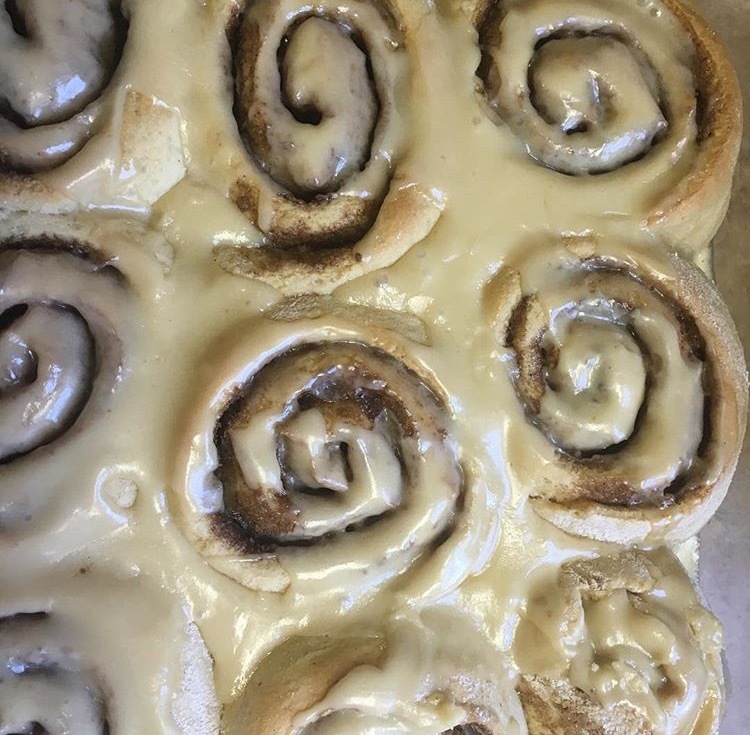 We have embraced new ingredients in our kitchen and enjoyed each one. And I feel like I have learned so much as I have cooked my way through this book. While cooking through this book, I have tried new grains at restaurants too. While in Florence, AL last fall, I tried a meatless Monday entree that consisted of creamed sorghum with roasted fall vegetables and a poached egg. This dish inspired me to play with whole grain grits and seasonal vegetables to create my own meatless Monday meals. Everyday Whole Grains is a great addition to any cook's kitchen. It has really encouraged me to get out of a cooking rut in my own kitchen. I now find myself thinking about ways to add farro or quinoa to a traditional breakfast or dinner meal. The textures and flavors are fun to play with as I prepare meals for my family. This book would also make a great gift for someone looking to cook healthier meals or just someone that is adventurous in the kitchen. Pick up a copy for yourself, a friend or a family member. I'm already thinking of who would enjoy this book in my life besides myself. This weekend, I have enjoyed doing some sewing at a leisurely pace. Since we are almost done with the pop up, I feel like I can slow down and enjoy the rest of our project. With uncertain weather, we decided to not pop up our camper this weekend and enjoy a little down time. For me, that meant finishing the last of the sewing - throw pillows. 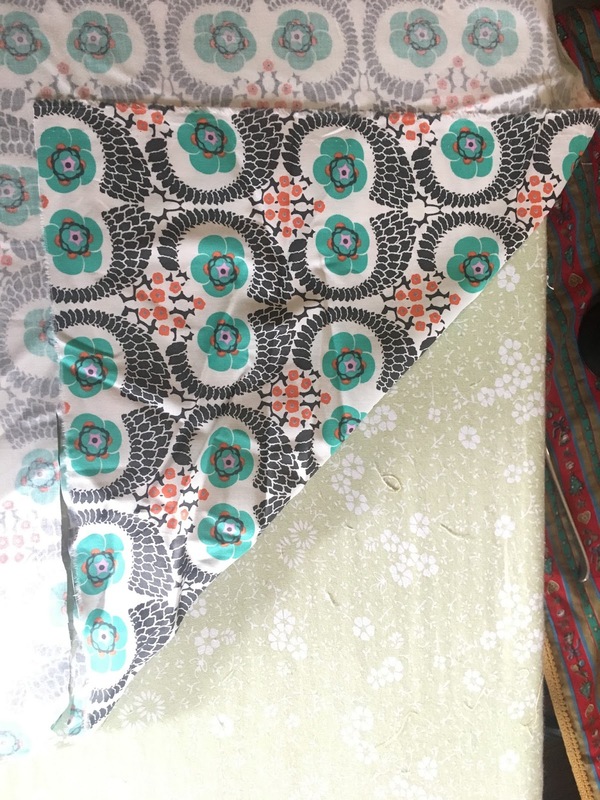 I started out by cutting 13 inch square pieces for the front and back of each pillow. 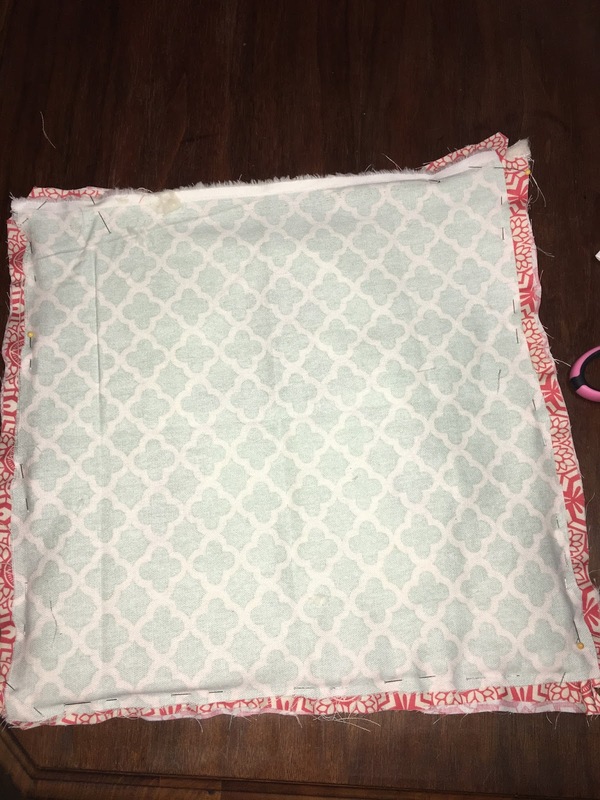 To make my square, I folded over a triangle corned and measured 13 inches on one side and cut. When unfolded, I had a 13 inch square. This makes easy cutting. Folding to cut makes this step easy! 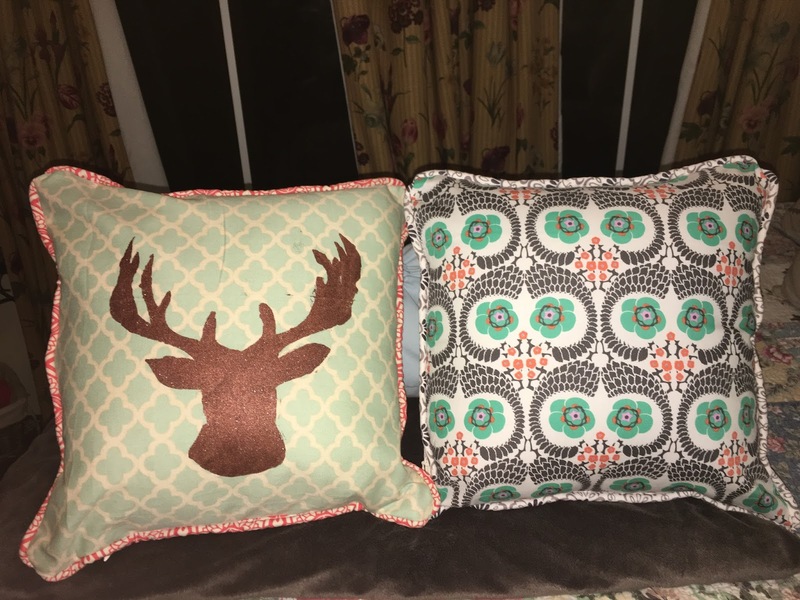 For two of my pillows, I wanted to have the deer theme from my valances incorporated. 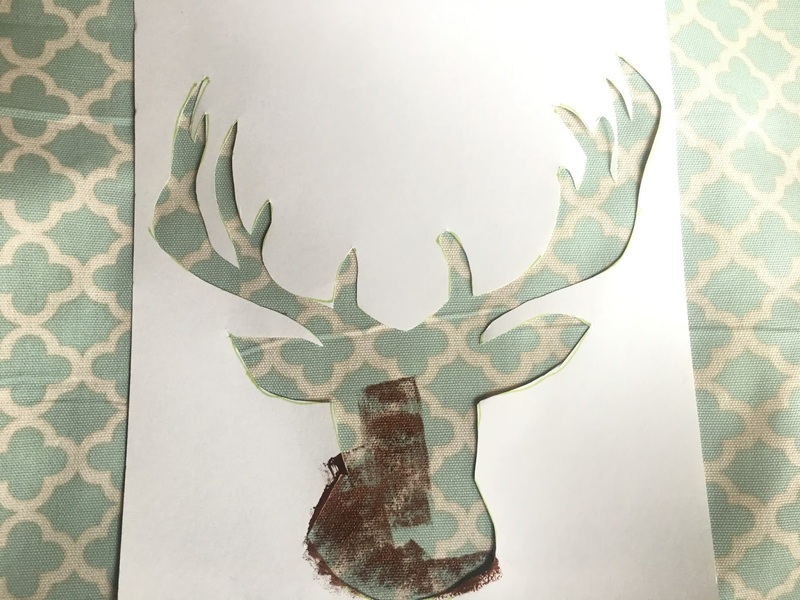 I found a deer head PDF online, printed on card stock and cut out. 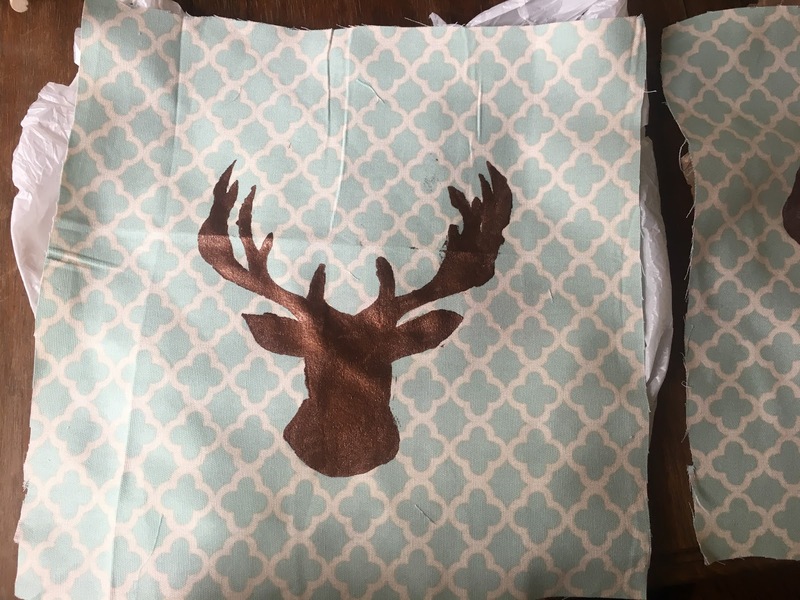 Deer stencil for bed pillows. Next, I used double sided tape to tape my stencil on the fabric so that I could paint it on. 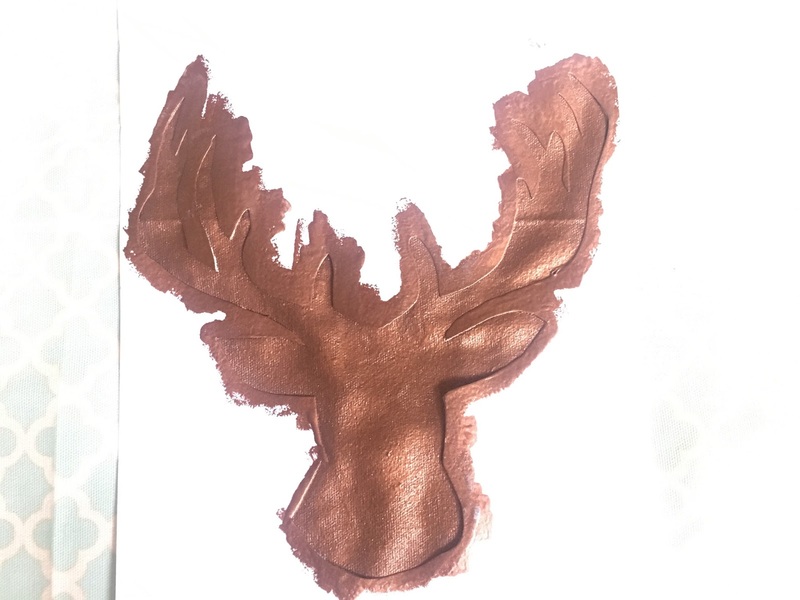 I used a foam craft brush and craft paint to stencil my image onto the fabric and let it dry. 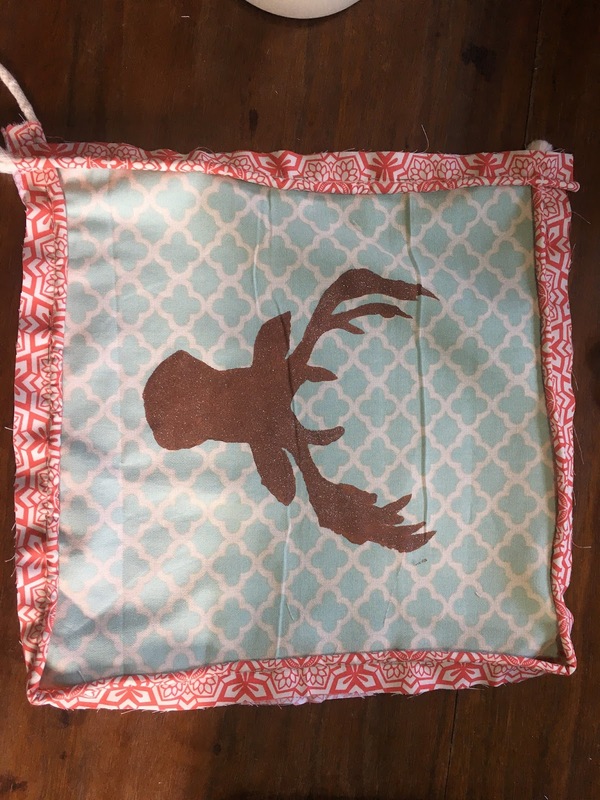 This method could be used to stencil initials onto pillows and other simple designs. Or a simple applique could be used depending on the desired look. Stenciling the design onto my fabric worked fine for our camper project. I used craft paint that I already had along with double sided tape to keep my stencil in place. Fill in the stencil completely with paint and carefully lift. Now, I moved on to piping. I sewed strips of fabric around the piping for each pillow. 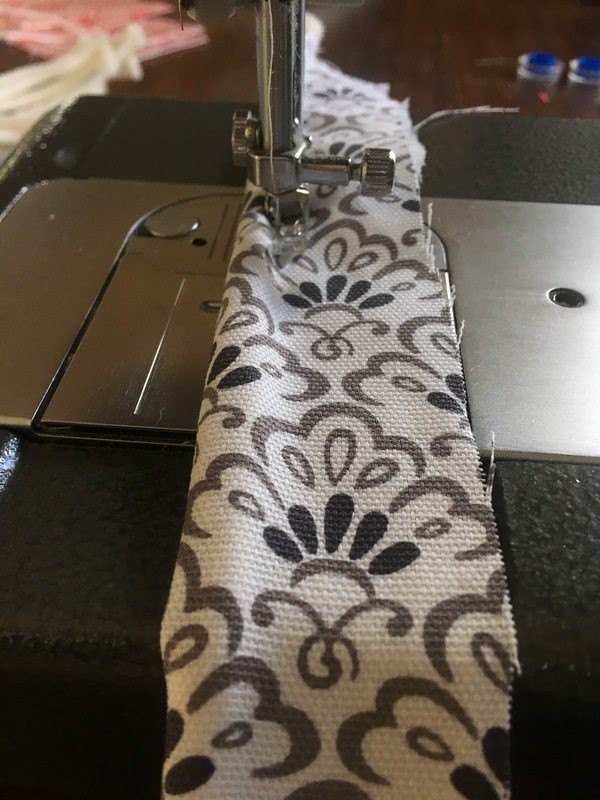 I always use a zipper foot to make piping. 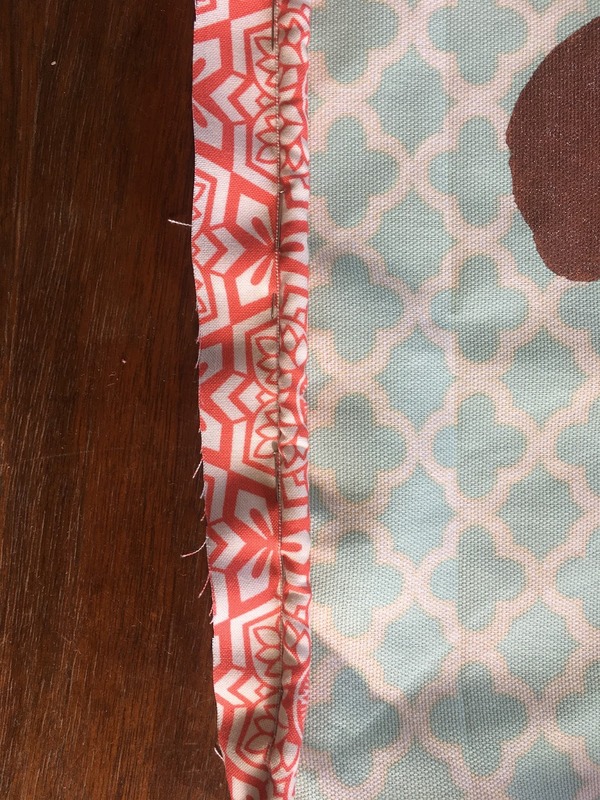 I pinned the piping with the raw edges on the outside and facing the right side of the pillow. When sewing the piping down, I cut the corners with a little v shape to make them lay flat. To attach the zippers, I sewed down one side of the zipper to the back right side of the pillow. 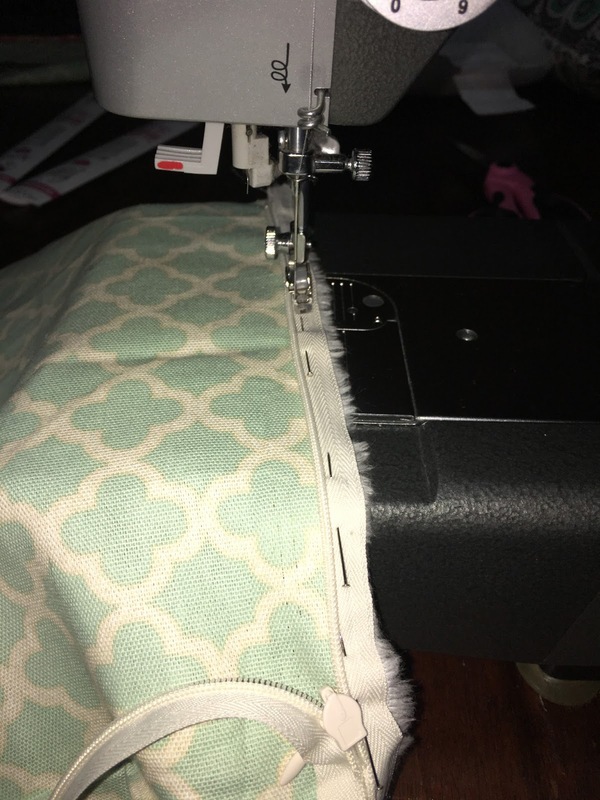 The goal is the sew the zipper so that the right sides will be facing each other once the zipper is in place so that the pillow can be turned right side out and stuffed with the insert. Then, I attached the other side of the zipper to the front piece of the pillow with the piping sewn down. With the zipper attached to both sides. It is important to pin the remaining sides together to finish. Make sure to mark with the zipper starts and ends to close around the zipper. 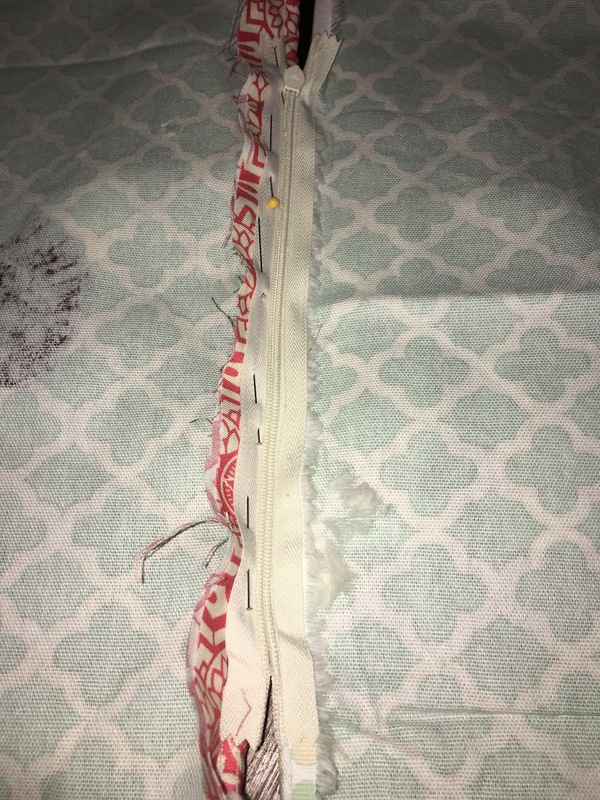 Once stitched around the entire pillow, turn right side out and stuff with the pillow insert. Pillows can be made of lots of different kinds of fabric and the piping edges can be made to coordinate with various prints. I enjoy mixing things up a bit when sewing project like this. Throw pillows can be made in lots of different sizes. 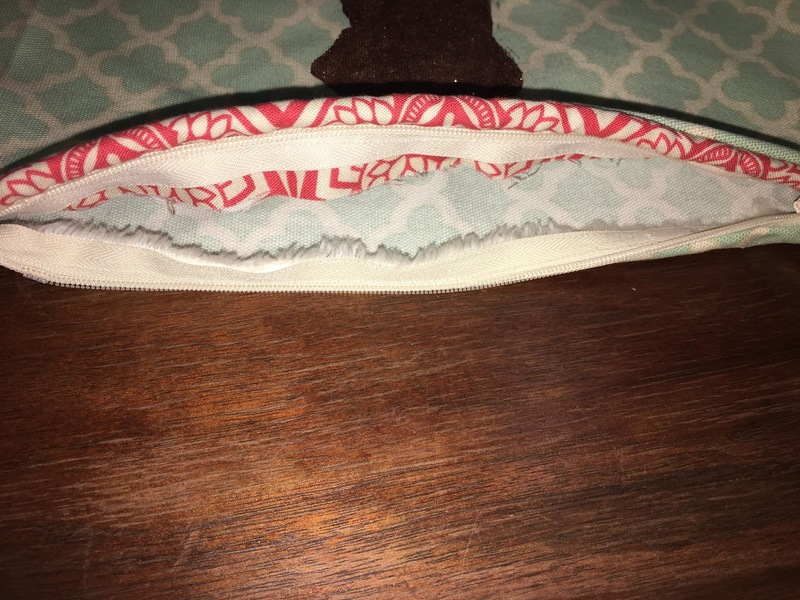 And zipper closures are not a necessity, but I like being able to take off the pillow cover to wash or replace the inserts if I want to. 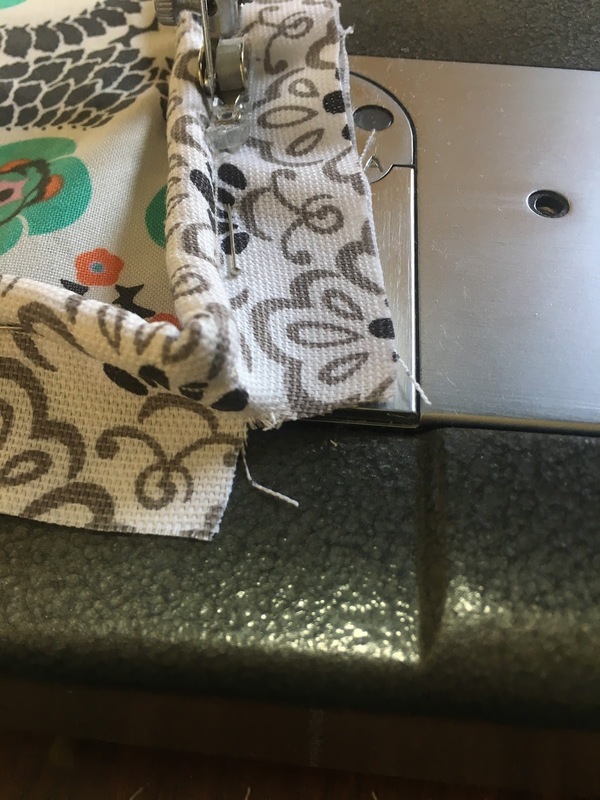 Invisible zippers are best for this kind of project because they give a neat closure. Pillows make great gifts and a way to make a space feel homey. I really feel like these pillows are going to add to my pop up camper space. Part of this project for me is being able to enjoy camping while feeling at home wherever we go. Smaller pillows like these 12 inch ones will give me that look and feel without taking up so much space. 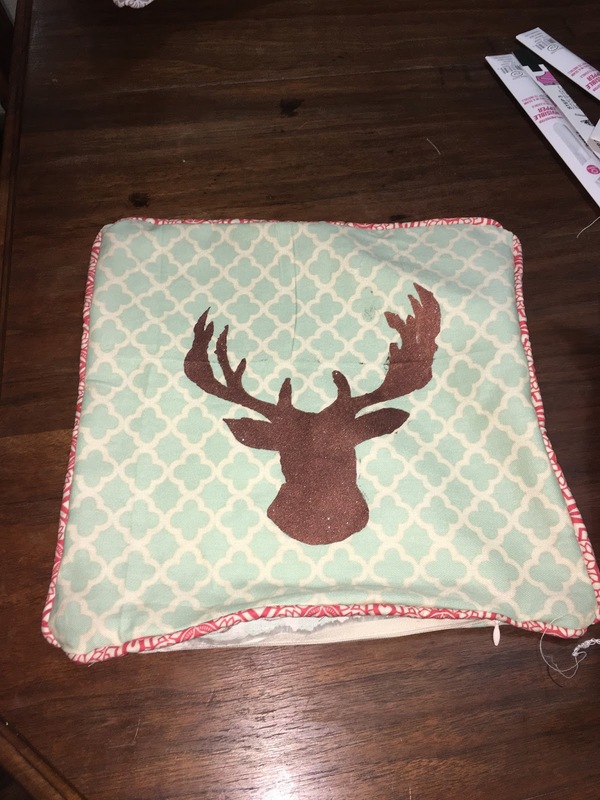 The deer pillow is for the bed. And the print pillow on the right will be on the seat cushions. My husband and I started drinking a smoothie for breakfast every day a couple of years ago. It is as easy as it is delicious. Both he and I are creatures of habit for certain. We both have our favorite smoothie and we tend to have almost every day. I resisted Shakeology for a really long time. The cost was a deterrent. And, I just couldn't justify it in my mind. Then last year, a former co-worker encouraged me to do a Beachbody Health Bet Challenge. I took the plunge and ordered a bag of Shakeology. I was hooked from the first shake. First, when you open the bag, the drink mix actually smells good. It doesn't smell like a mysterious bag of unknown chemical powder. And it tastes great. I'm not a nutrition expert, so I am not going to make claims that I don't know about. What I can say is that I am not hungry until well after lunch daily. I don't snack when I have a Shakeolgy shake. And, I feel great. It is a compliment to my morning workout. I love them so much that I travel with for work packing a blender to make my shakes in hotel rooms. This Hamilton Beach Personal Single Serve Blender with Travel Lid is perfect. It costs less than $15. I have taken this thing all over with me and 2 years later, it is still going strong! Blend and that is it! It is just like drinking a Butterfinger. And for someone that really struggles with sweets. It is just what I need to keep me from wanting sweets during the day. I wish I could be one of those people that says, "I don't like sweets." But I'm not. So, this is my substitute for that, and I'm okay with that. I do order my butterscotch pudding. The Jell-O Brand is better than the store brand. Seriously. Trust me on this one and just order. I get 6 boxes at a time, and when I'm almost out reorder. I order everything else. What is one more thing? My husband, on the other hand, likes Orgain Organic Plant Based Protein Powder, Sweet Vanilla Bean . And I can say that it is a great shake. There is a big price difference between the two. About $100 to be exact. Maybe I should be glad for that. 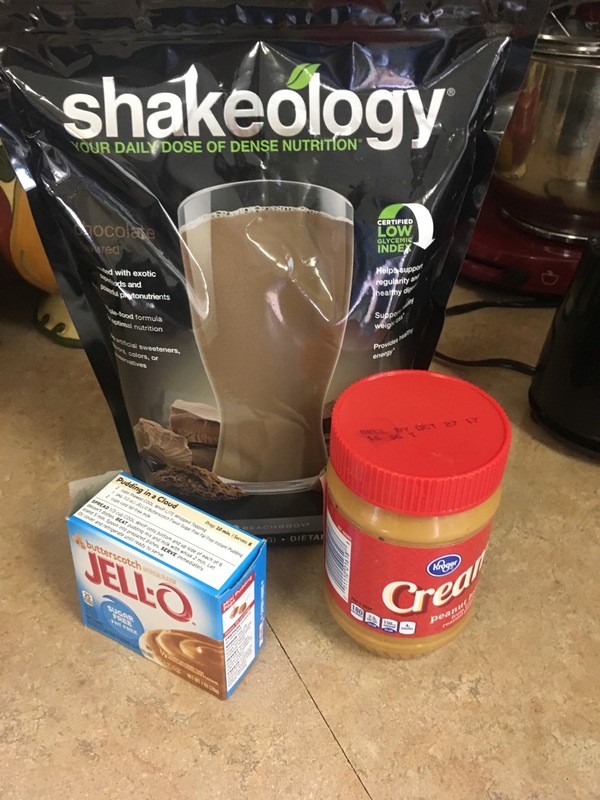 I received this shake mix as a sample in a VoxBox about a year ago and bought a large container with a coupon. He was hooked. It does smell nice, has a good taste and nice texture. I just prefer the Shakeology. Orgain also has has premade ready to take shakes that are really great for travel. I can say that the Orgain Grass Fed Protein Shake, Creamy Chocolate Fudge ones are good. 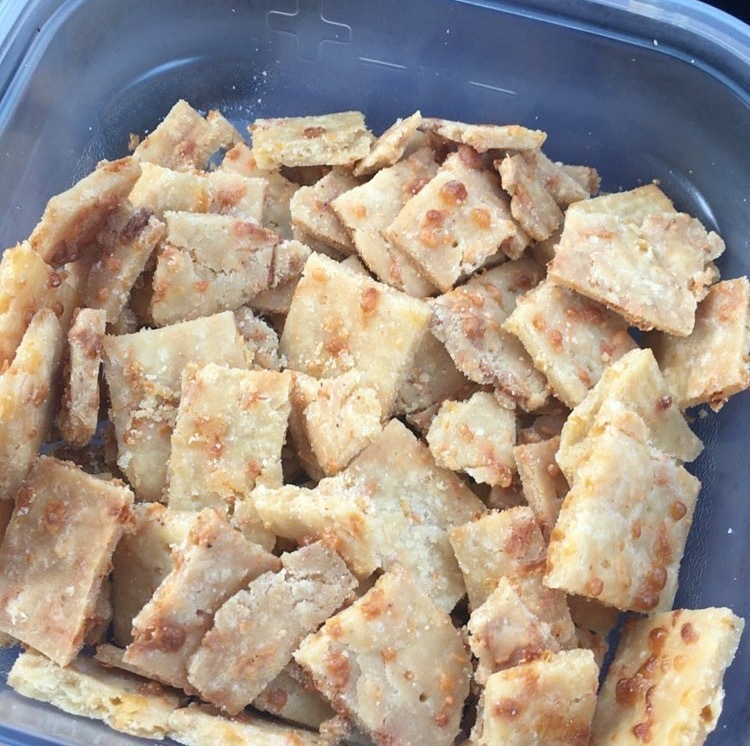 I like them and enjoy having them in the car for snacks or to help me make it to a healthy meal option on long days. 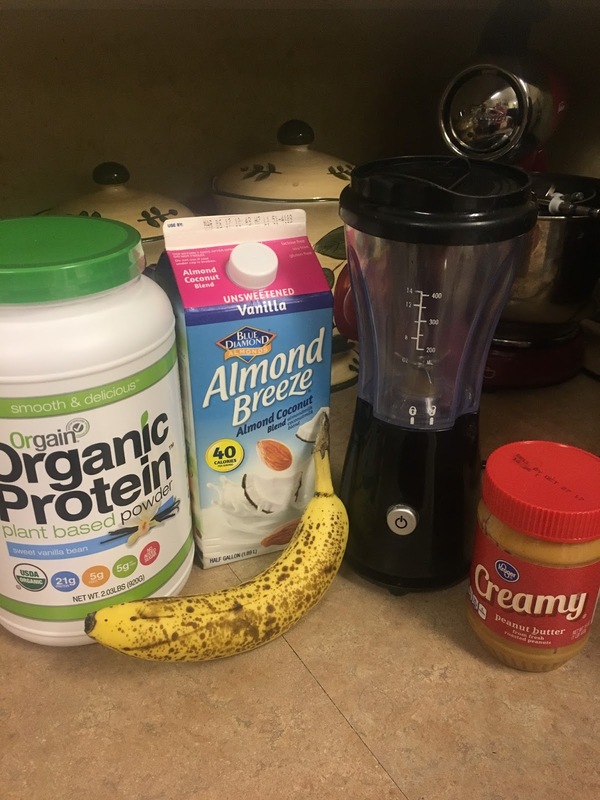 The shake combo that my husband tends to stick to is a Peanut Butter Banana Shake. Shakes don't replace real food. We eat plenty of fruits and vegetables in our home. I definitely don't think that a healthy diet consists of a steady stream of liquid shakes. But one a day is a great option for us in our home. Give it a try and see what you think. And if Shakeology is too expensive for the plunge now, try the Chocolate Orgain and make a Butterfinger Shake with it. It is still great. I've done that too. And if you are interested in other smoothie options and recipes, take a look at my Smoothie Pinterest Board. I have quite a few saved. So get our there and get your smoothie on! 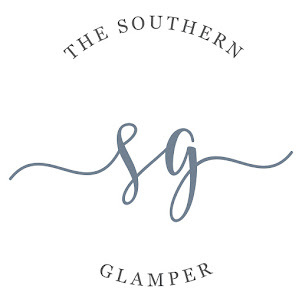 This week I've taken a break from all things pop up camper! It been nice to slow down, cook, workout and just be. Even though I have loved this project, I was starting to go a little nuts. Tonight I made a dish that had become a weekly staple at our house. After eating creamed sorghum with roasted fall vegetables, a poached egg and sorghum vinaigrette, I have been obsessed with this combination. Its the perfect night time breakfast meal. And my husband loves it. I've done lots of variations of this meal, but the one I'm sharing on my blog is my favorite. Most of the ingredients are household staples, so this is an easy dish to make of what you might have on hand. I'll include some variations at the end of this post. 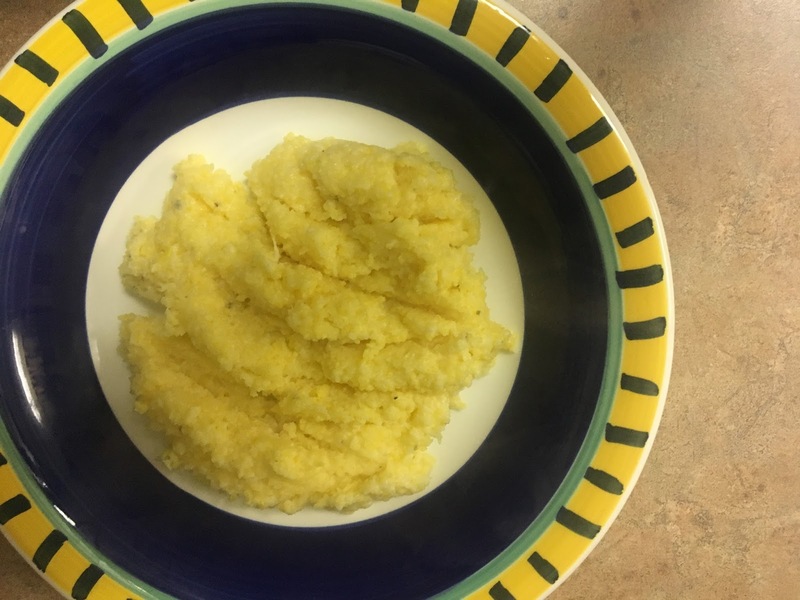 This dish starts with simple grits. To this, I add a green. Arugula is my favorite. But spinach or any green could be used. Then I top with roasted chick peas, butternut squash, sweet potatoes or even broccoli. I add a poached egg and vinaigrette. Dinner done! It is easy and can be finished in less than 30 minutes! Start draining and rinsing a can of chickpeas. I toss with 2 teaspoons of olive oil, 1/2 teaspoon of garlic powder and salt and pepper to taste. Line a baking sheet with Reynolds Cookie Baking Sheets Parchment Paper . Using parchment paper makes cleaning up a snap! Place in an oven that is preheated to 425 degrees and roast about 20 minutes. Stirring midway through and make sure that they don't over brown. While the chick peas roast, start the grits. I use a cup of grits, 2 1/2 cups of water and 1 cup of milk. Cook over medium until they start to thicken. Then add 1/4 cup of Parmesan cheese. Parmesan packs a lot of flavor so you don't have to add so much! Love this. Next, I make the vinaigrette. Last year I attended a show where Smokin' Hot Honey from Asheville Bee Charmer had a booth. This honey is perfect to add to savory dishes, glazes and dressings. 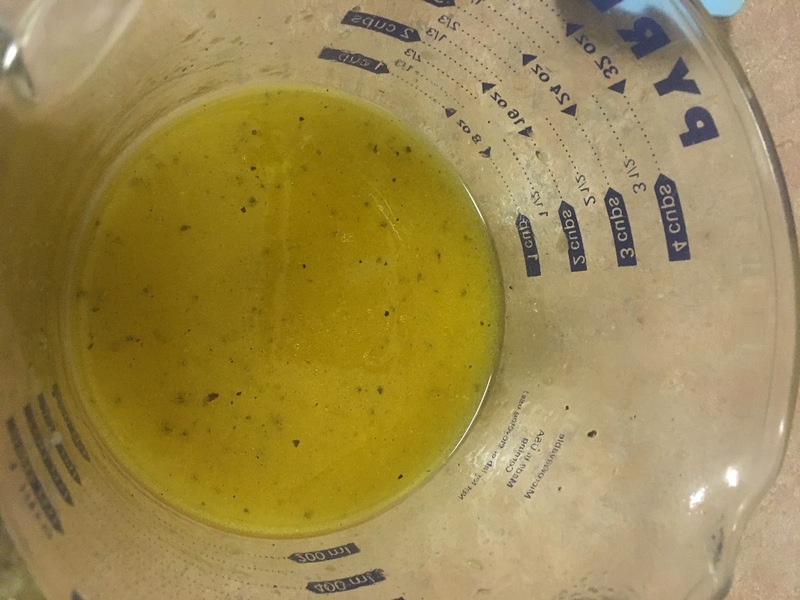 I make the vinaigrette for the recipe with apple cider vinegar, smokin' hot honey, olive oil, Dijon mustard, white Worcestershire, salt, pepper, and grated onion. This is a smokey sweet kick to the grits bowl. Think dressing for your salad over grits. Its really great! Finally, I start the water for my poached eggs. I do a simple poach where I add a tablespoon of vinegar to my water before adding the eggs to help them set. I cook them at 100 degrees water temperature for 4 minutes. 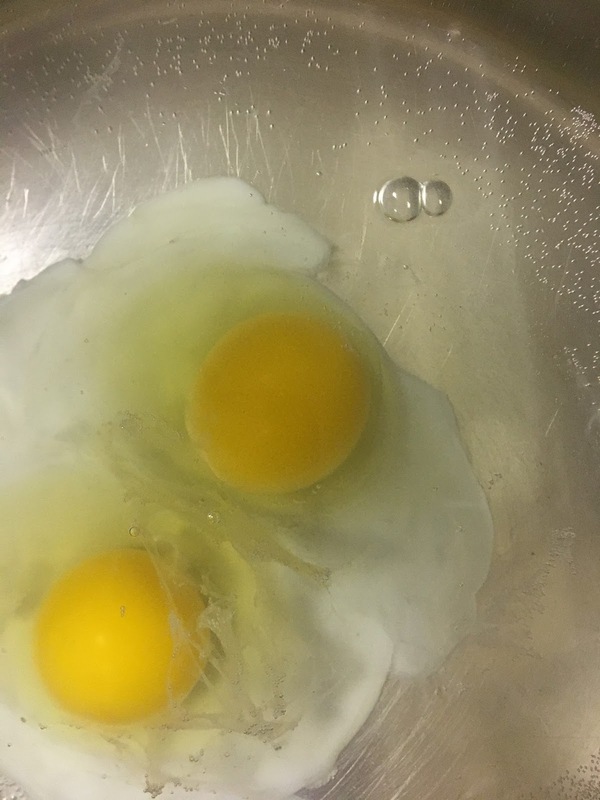 This yields a nice thick creamy center to the egg. 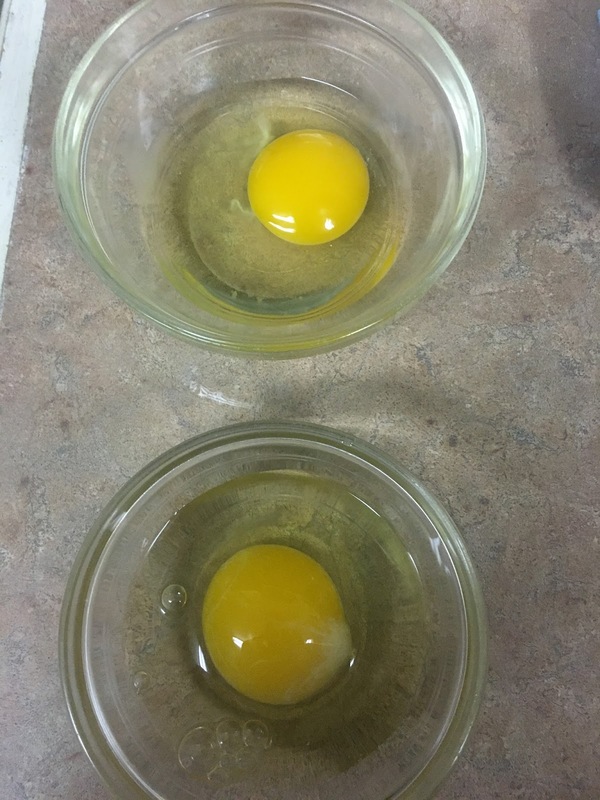 Crack eggs into a small bowl and slide the eggs into hot water from the bowl. Poach the eggs for approximately 4 minutes. To assemble, place a spoon of grits in the bottom of the bowl. Top with arugula or your greens. Spoon over with roasted chick peas. Top with 1 or 2 poached eggs and a drizzle of the dressing. If you don't have the Smokin' Hot Honey, get some! You need this in your life! Or, you could make this with regular honey or even molasses. That honey! It makes great gifts too. 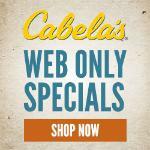 Its such a unique product and is great for your favorite cook or person that has everything! 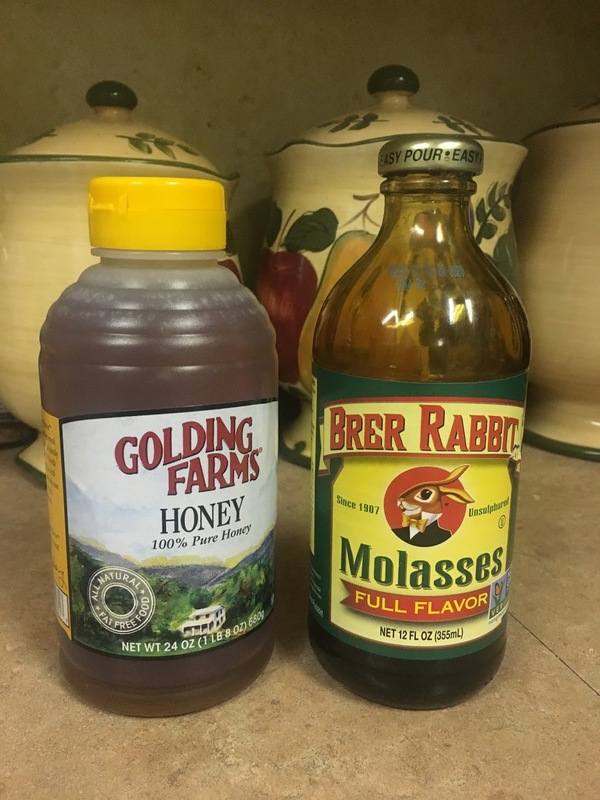 Regular Honey or Molasses can be substituted. I typically have left over chick peas and grits. So normally the next day for lunch someone has a scaled back version of this for lunch minus the egg. Its easy and tastes great the next day. The extra dressing can be stored for a week to 10 days in the fridge. Its great of any salad that you might make during the week. You will use every bit of it up. Rinse and drain a can of chick peas. Toss with 2 tsp. of olive oil and 1/2 tsp of garlic. Roast at 425 for 20 minutes or until brown. Stir half way through. Prepare grits by stirring together water and milk and grits. Cook over medium heat stirring often. When the grits start to thicken, add 1/4 cup Parmesan cheese. Prepare the dressing by whisking together all ingredients. Salt and pepper to taste. Set aside. Start water in a large skillet. You will need about 2 inches of water. Add 1 tbsp of vinegar. Heat the water to 100 degrees and keep at a constant temperature. You will need to monitor with a thermometer. Stir the water in a circular motion and drop your egg(s) one at a time into swirling water. I only cook 1 or 2 at a time max. Cook for 4 minutes. You can go longer if you want a less runny center. While the eggs are cooking, assemble the grits bowl. Place grits in a bowl. 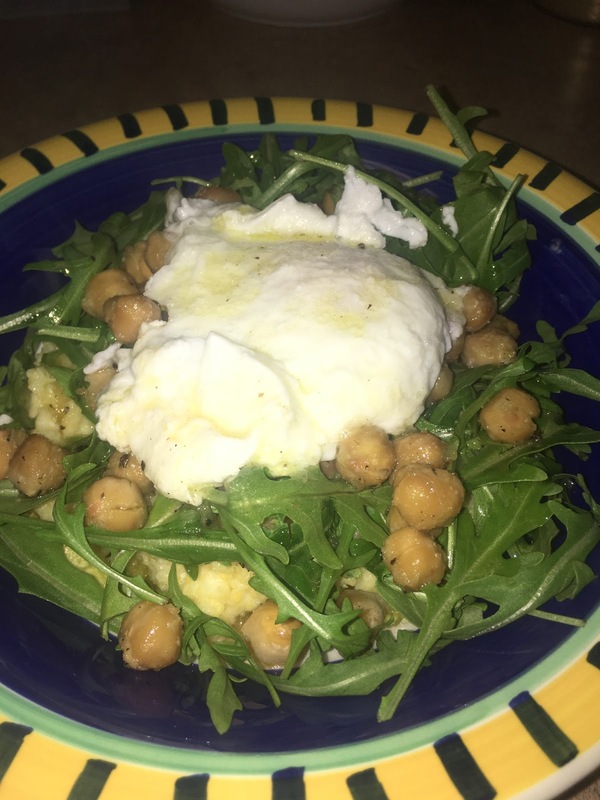 Top with arugula. 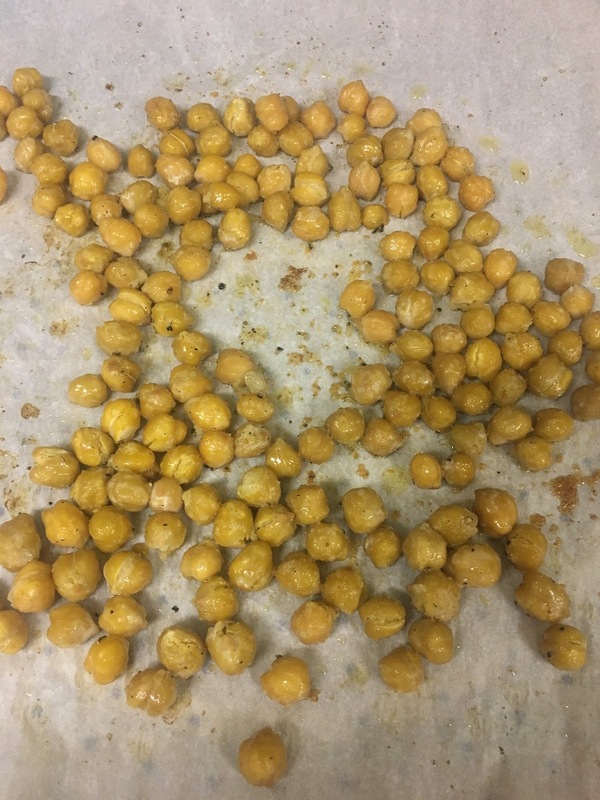 Add a spoonful of roasted chickpeas. Remove egg with a slotted spoon from the water. Drain holding the spoon over the water. Drizzle with vinaigrette. Be creative. Use what you have in your kitchen that tastes great to you. Its a great way to use up odds and ends or make a tasty desperation dinner.